What I love about new technology is how it can connect people, keep families in contact and allows us to share memories together. I have been quite behind the times with digital photos frames and never had one. Considering the number of photos I take, you would like I would have one. 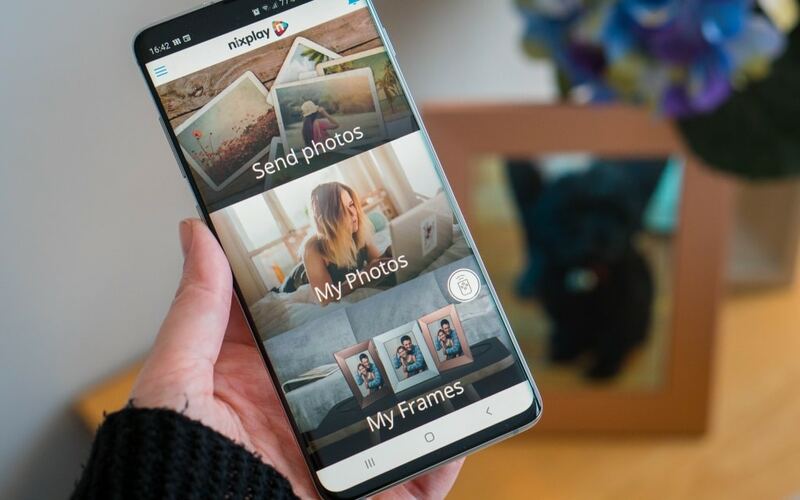 When Nixplay got in contact with me to show me their range of digital photo frames I was really impressed by the WiFi enabled ones. It meant I was able to connect my Instagram account to the digital photo frame. I take part in the Project365 photo a day project, which I have done for 4 years in a row now! This means I have over 1400 images that I’ve shared on there, plus the ones in between. Put it this way, when I uploaded my Instagram photos to the frame I hit the 2000 photo limit that is set for that one playlist. But don’t panic if you’re like me and have loads on your Instagram, the 2000 limit is only for that one playlist folder, you can add more playlists!! It now means my Instagram page can be enjoyed long term and not just a social network for me to upload to. What can you connect to the digital photo frame? If Instagram isn’t your thing you can connect other social channels and photo storage like Facebook, Dropbox, Google Photos and Flickr. This makes uploading your photos to your frame super easy and quick. How do you upload photos to the digital photo frame? You can either upload the photos by using their simple to use app or on a computer. 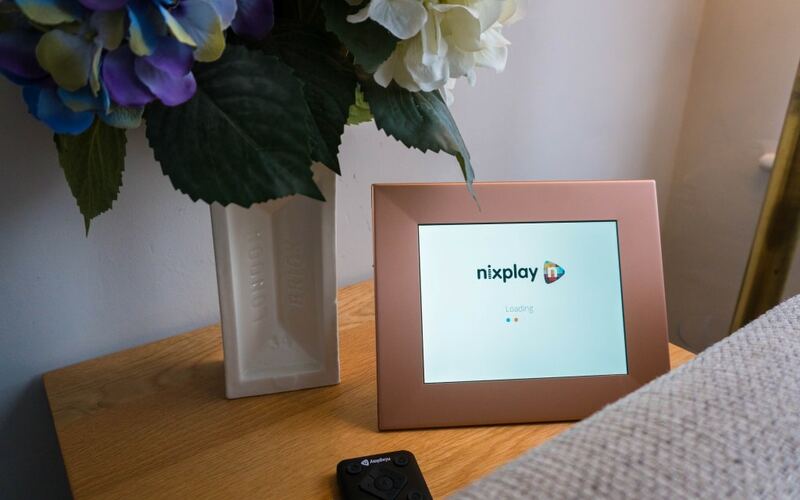 When registering the Nixplay digital photo frame you need to make sure you do this on a computer and sign up to a register an account. Once your account is open and the frame is paired you can fill up your frame full of photos. You can now start using the Nixplay app if you prefer, creating different playlists to add into your frame. All of this is done by not even touching the digital photo frame, just by adding them to the cloud. With 10GB of free cloud storage and being able to add up to five frames to each account means you have a lot of photos to upload before you hit the limit! I have about 2400 in mine currently, and I am using 7%!!! This is the function I love and how I really think this works for family and friends. You can add friends to your frame by inviting them by e-mail. From then they can then add their photos to the cloud, which will then be adding to your frame! I love the idea of this for family and friends who don’t live nearby. You can upload your photos to their frames! I loved that you can name your frame whatever you want. You can even have the flexibility within the settings to adjust the transitions, times between changes, shuffle and even a display clock. You can see this one transitioning through the photos to the next one here, you can pick your transitions or have them random. It comes with a handy little remote to use to control the frame, turning it on, skipping, pausing, and going back, which has been done a lot by my kids when they see a picture they love! It comes with an activity sensor which detects when there is sound in the room and will play the photos, but when it’s quiet it will stop! With Nixplay Iris it will dim and brighten its panel to best display photos according to your ambient light level within the room. You’re not tied to one way or the other with the Nixplay digital photo frame, just turn the frame to the way you want and the photos correct themselves. 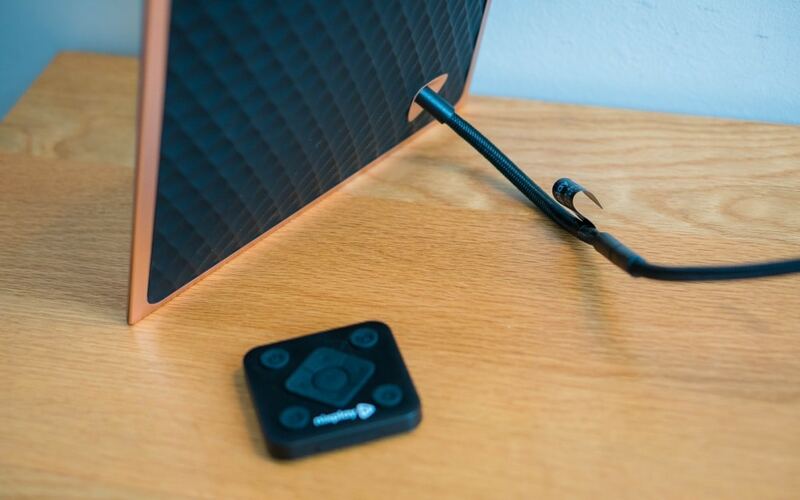 A handy stand is even part of the power cable so you can have it whatever way you want. We all love it and are really enjoying seeing so many of the photos I take but never get to see that often. But the kids are really enjoying it. The first thing my daughter does when she comes down in the morning is turning on the Nixplay digital photo frame and you can hear the lovely little reactions when they see the photos from years ago of the things we have done together. It really ignites their memories. 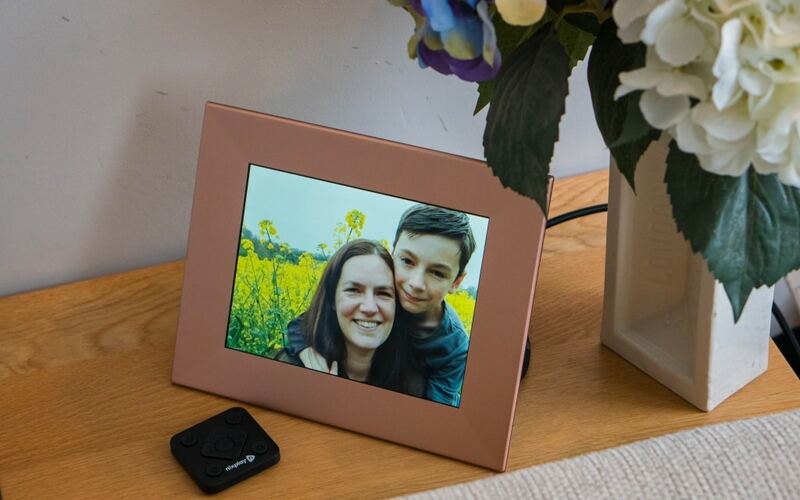 The Nixplay Iris 8″ digital photo frame is priced at £169, this isn’t a cheap product but it does so much and has so much potential to connect families and friends. I am very impressed with mine. 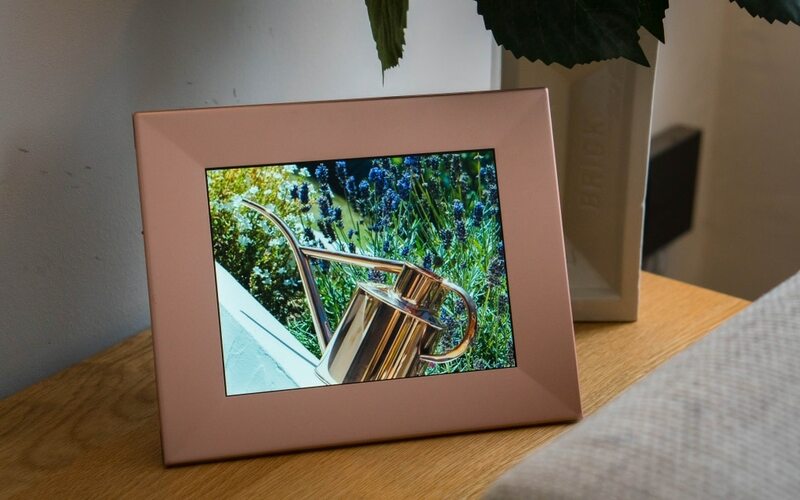 I have the peach copper frame but it’s available in three colours, silver, peach copper and burnished bronze which all work really well with your interiors. *I was sent a Nixplay digital photo frame for the purpose of this review. However, all opinions and words are honest and of my own. Enter below for the chance for you to win the same frame as I have, worth £169 and fill it with all your memories. I like the silver frame the most. The peach copper, would look great in my dining room. The Silver one is my favourite. silver frame one would be my choice. I love the silver frame the most. The rose gold colour is lovely! I love the Burnished Bronze. Although all of them look lovely. My favourite is the silver colour. They’re all lovely but my favourite is the peach copper. My favourite is the burnished bronze. I love the richness of this colour. I would love Rose gold. The peach copper and the silver are my favourites! I can’t decide between peach copper or burnished bronze, maybe the bronze, just by a whisker. Thanks for the competition. Silver one, goes with my colour scheme in my living room. My favourite is the silver! I love the Peach Copper! The silver one is my favourite. Would go in all rooms. I love the burnished bronze, it’s a very warm tone. I like the Copper coloured frame best, it looks nice. Peach copper is very stylish. I like the Peach Copper one. I really like the peach copper colour – really modern. I love the peach copper frame colour the most. I really like the silver one! I love the peach copper. Looks fab! The rose gold frame is beautiful. They are all lovely but I like the Burnished Bronze one the best. Would love to win this amazing digital photo frame. I am an avid photographer and love photographing my children, it would be lovely to see their beautiful little pictures displayed on this frame without worrying about all the time consuming hassle of printing, buying many frames and finding somewhere for them to all go. I would lobe the Burnished Bronze. The Peach Copper one as it would fit perfectly into my Daughter’s new rose gold bedroom. What a great idea. I love that you can upload to a family frame as my parents live a distance away. The peach copper is a bit different and very smart looking. I would choose the silver frame. Love the silver, so elegant! I love the copper one. I like the peach Copper colour! I like silver best. I know rose gold and copper are “in”, but I still prefer white metal! I think I’d go for the Burnished Bronze, however if it’s to go anywhere other than my home office, Helen is going to insist on the Silver! I really like the peach copper – it would go very nicly in my living room. I like the bronze colour. These look fab! They’d make the perfect gift! I love the peach copper frame ! I like the peach copper! I love the peachy copper one, so fingers crossed for a win. Great post though, I actually didn’t get a photo frame because I thought there wouldn’t be enough room for me, I had no idea they had brought out cloud versions as I haven’t kept up with the technology. Now that I know, it’s on my list, so thank you! i love the brushed bronze coloured one! I like the copper one. Peach copper is my favourite. What a brilliant idea! I can never decide which photos to frame, this would solve that problem. I love the peach copper frame too. Oh the peach copper is the great choice. My mum has something similar and I love seeing all the memories and chatting about the good times. A great giveaway too. I love the burnished bronze, would go perfect with my other items! I like peach copper the most; it’s got a lovely warm tone to it. Silver – it’s a classic ! I love the idea of these. I have so many favourites that I can never choose which to print. These are fab and a great way of making the most of photos that otherwise end up on our phones forever. That reminds me I need t get some more up to date prints done! I like them all but the Silver one is more traditional! I love the silver colour. I love the peach copper it would go well in my lounge . I would love a silver one. It would be the perfect Mother’s day present for my Mum who leaves abroad. I love the peach copper. I love the peach copper one – would fit into my home style beautifully. Such a great idea – I love the fact it would be show off so many of your digital photos that otherwise never get seen. Peach copper is good ! 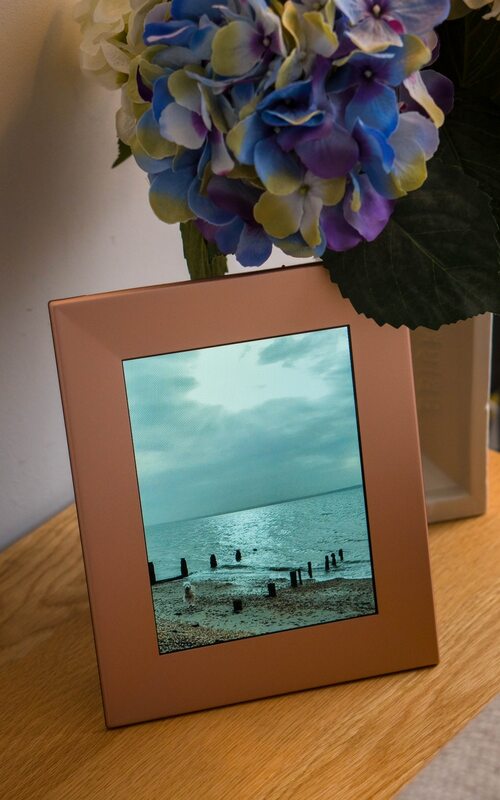 I love the peach copper colour frame, it looks really good and would match perfectly with my lounge! I love this Steph – what a great idea to bring the memories alive! I bet it’s a great conversation starter for when friends are round too!